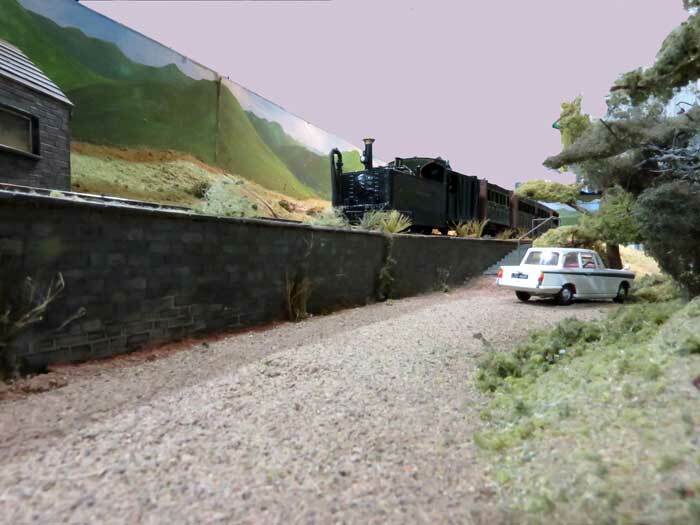 Scale: '0:16.5' [7mm Scale on 16.5mm gauge]. 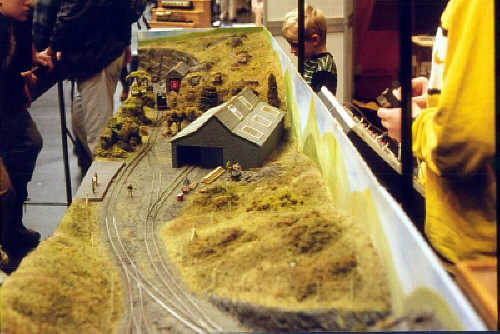 A layout featuring three scenes representing a Welsh narrow gauge slate railway from the quarries to the exchange sidings. 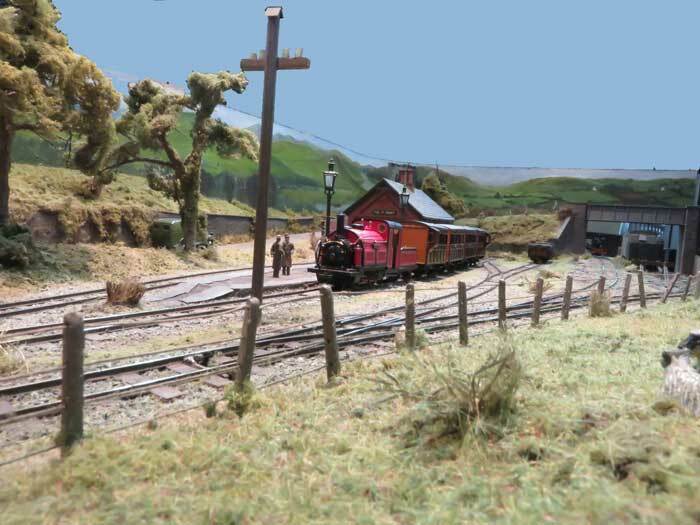 The name was taken from a village on the former Plynlimon and Hafan Tramway north of Aberystwyth, but the layout is not a model of any particular line. 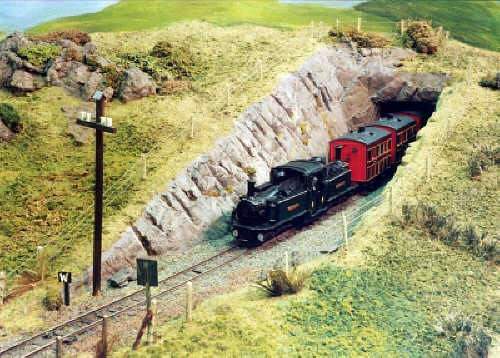 These railways were built to transport slate down from the hills to ports or mainline railways and passenger carrying was often a secondary consideration. 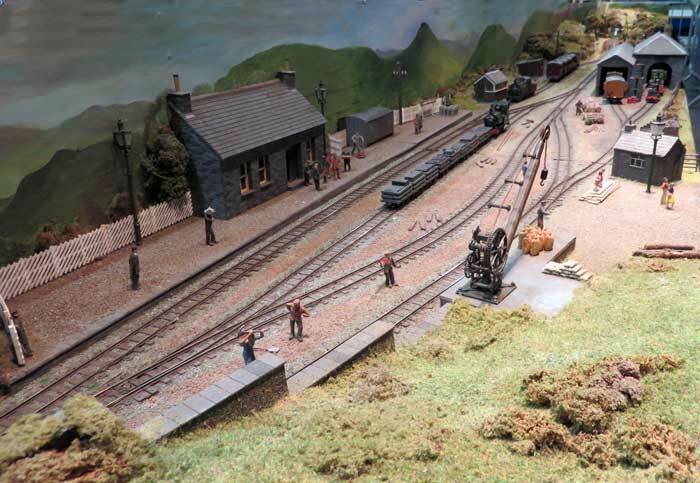 The model assumes the continuation of the slate traffic alongside a growing tourist passenger operation. 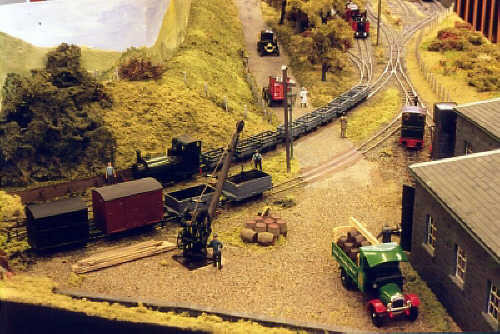 The quarry area shows the foot of an incline and a slate dressing shed. 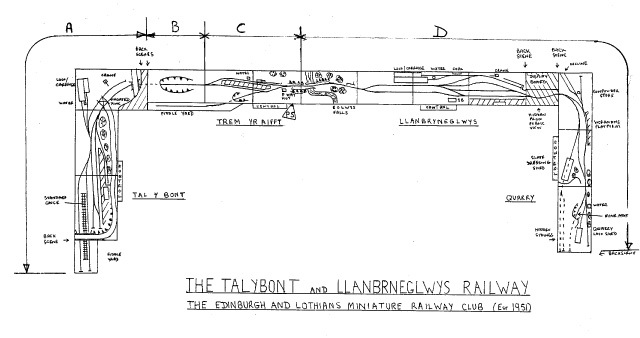 From here the mineral line runs to Llanbryneglwys where locomotives are changed to those suitable for the journey to Talybont and vice versa. 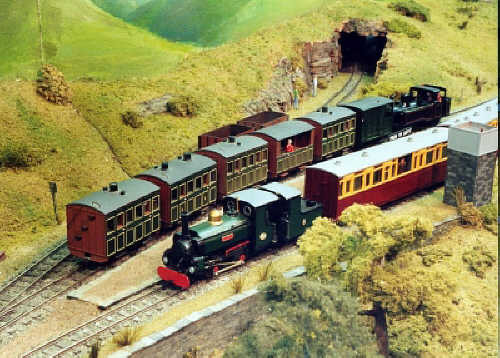 Llanbryneglwys is also the upper terminus for public passenger services from Talybont. 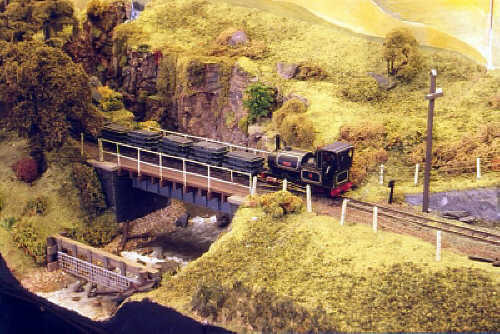 The line runs through some spectacular scenery over a river bridge to the passing loop at Trem Yr Aifft where there is a branch to a granite quarry. From Trem Yr Aifft trains continue to the terminus and exchange sidings at Talybont where the slate is unloaded and the empty wagons returned to the quarry. 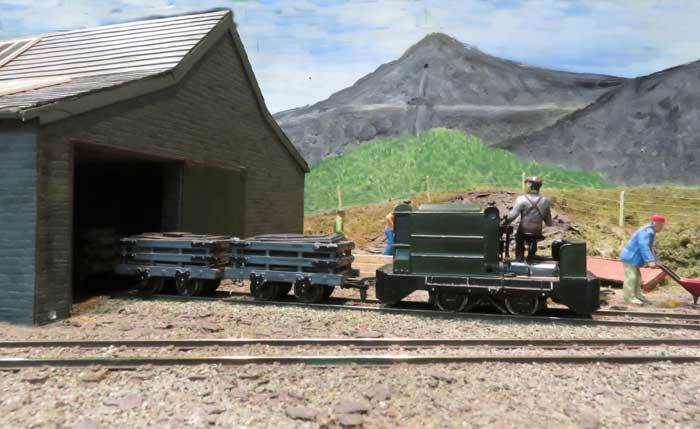 Standard gauge wagons in the exchange siding allow the onlooker to contrast standard and narrow gauge stock. 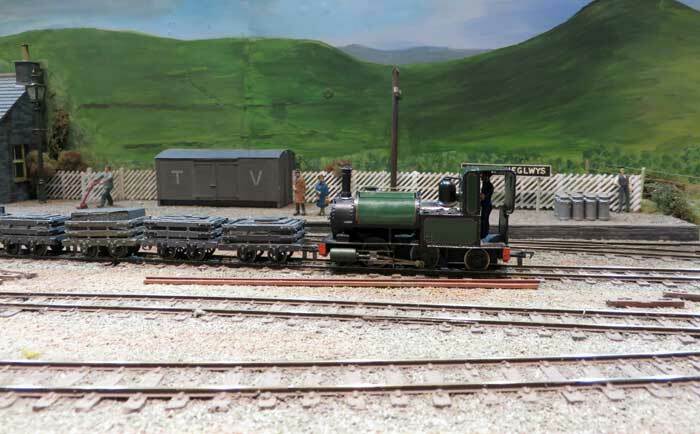 The locomotives are mainly built from kits and include locomotives from the Talyllyn and Festiniog Railways, the Glyn Valley Tramway, the Penrhyn, Llanberis and Port Dinorwic quarry railways and even a Scottish visitor from the Campbeltown and Macrihanish Railway. 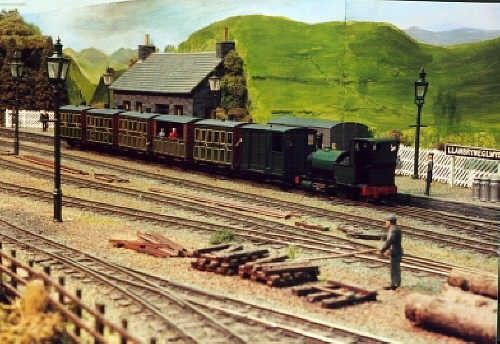 The station building at Talybont is a model of Wharf station and the engine sheds are based on Pendre, both at Tywyn, mid Wales, on the Talyllyn Railway.